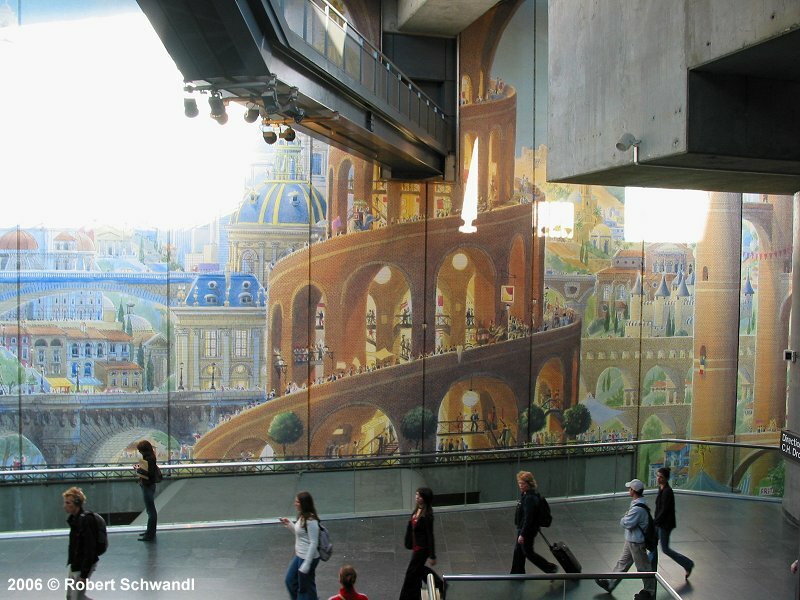 Lille is situated in the north of France near the Belgian border and actually right between Paris, London and Brussels. Although the city itself is not too large (210,000 inh. ), the entire metropolitan area (CUDL - Communauté Urbaine de Lille) is the fourth biggest conurbation in France with some 1.2 million inhabitants. 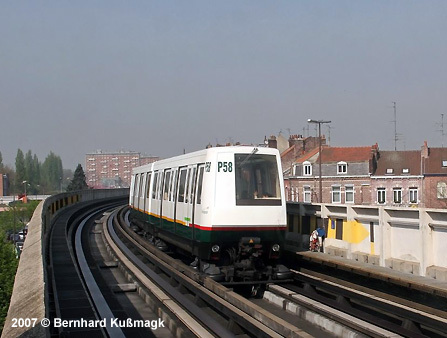 Lille is synonymous for a new generation of metro systems, a kind of small profile light railway operated automatically, the so-called VAL system (short for Véhicule automatique léger). After trials were carried out by MATRA during the early 1970's, the CUDL decided in 1974 to build 4 VAL lines in the metropolitan area. 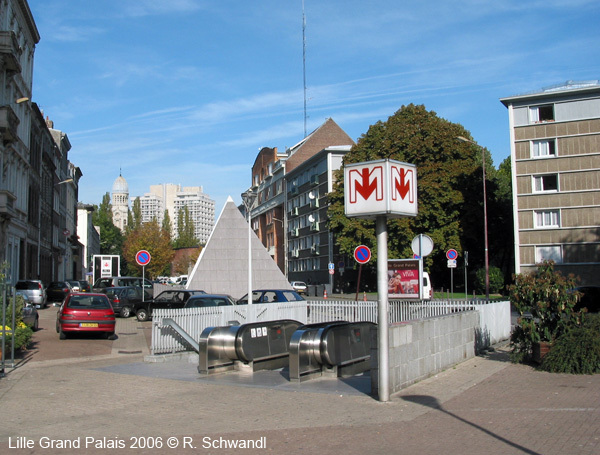 Construction started in 1978 and the first line was inaugurated on 25 April 1983 between 4 Cantons and République. 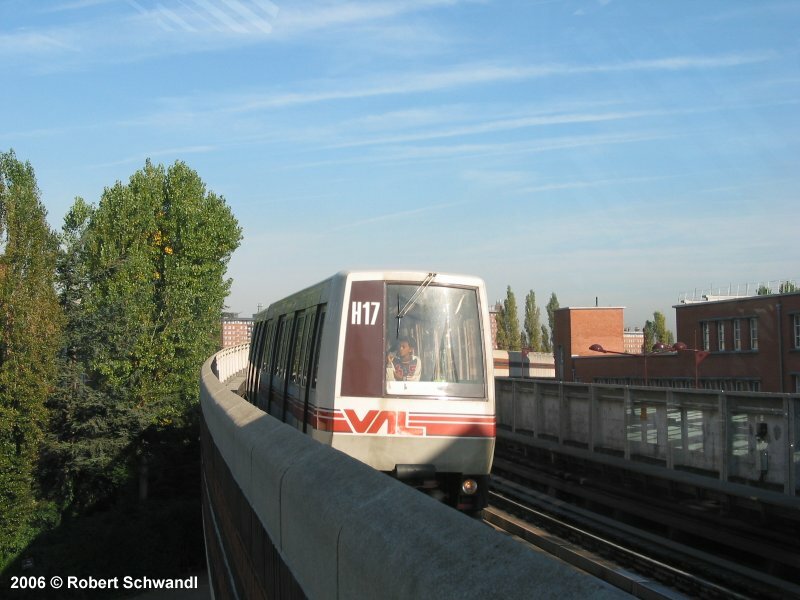 One year later, on 2 May 1984 the entire Line 1 opened (13.5 km long, 8.5 km underground). It links C.H.R. 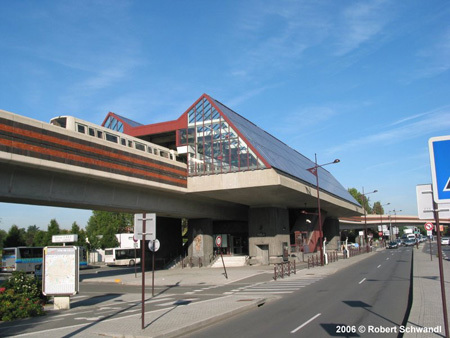 B Calmette (now CHU – Eurasanté) in Lille to 4 Cantons in Villeneuve d'Ascq via Gare Lille Flandres (Central Station). All stations have platform edge doors to separate the platform from the train. 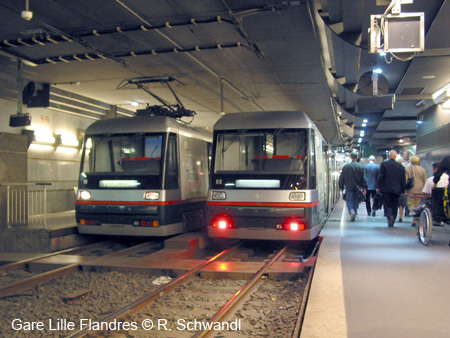 Line 2 opened on 3 April 1989, initially called Ligne 1bis, between St. Philibert and Gares, later renamed Gare Lille Flandres (15.5 km, 7 km underground). 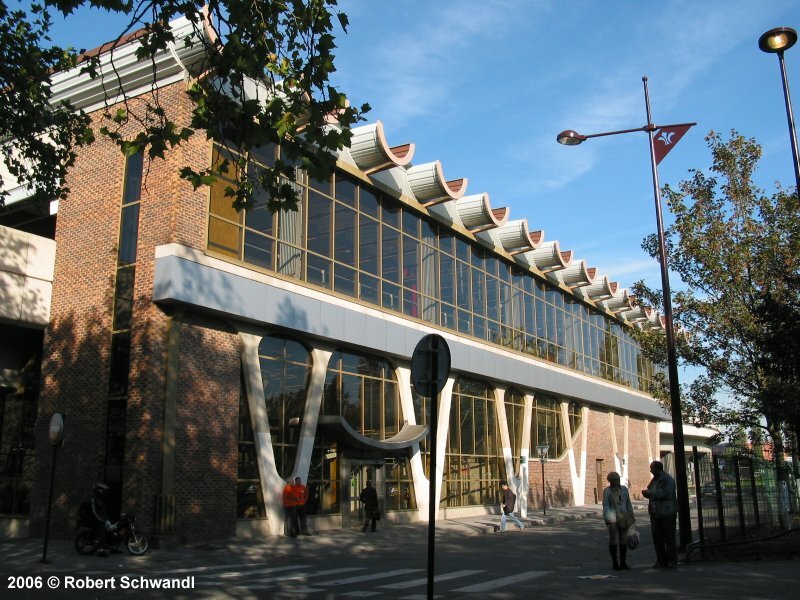 In 1994, there was a 1-station extension to the new TGV station Gare Lille Europe, and in 1995 the line reached Fort de Mons. 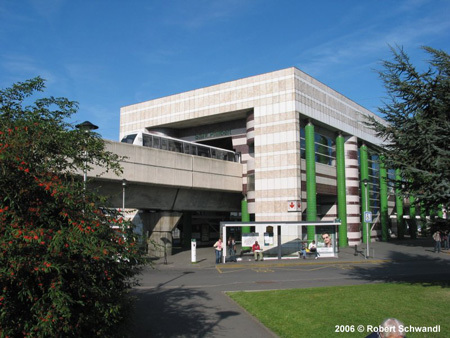 On 18 Aug. 1999, Line 2 was extended to Tourcoing-Centre (12.5 km - 16 stations) and it reached C.H. Dron near the Belgian border on 27 Oct. 2000 (3.6 km). The entire Line 2 is now 32 km long with 43 stations. Trains are only 2 m wide and 26 m long (two coupled cars) and run on rubber tyres. Possible minimum headway is 60 seconds. Platforms on Line 1 are only 26 m long (although most stations are prepared to be extended to 52 m), but on Line 2 they were built 52 m long, long enough for two units. 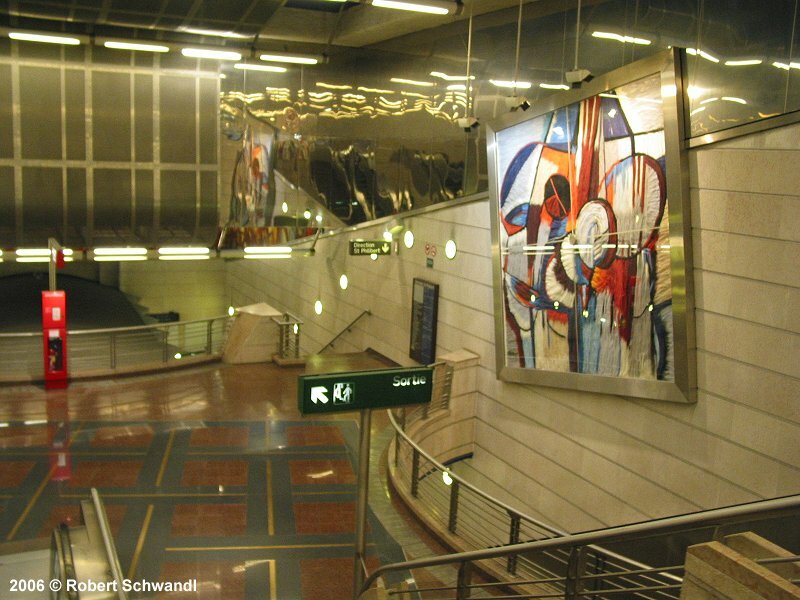 Stations are fully accessible for the disabled. 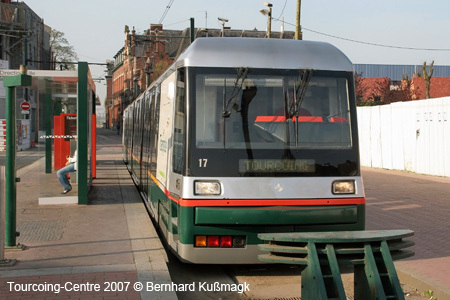 The Lille-Roubaix-Tourcoing tram, also called Mongy (name of its creator), mainly runs along 3 large avenues, which opened the same year (1909), it runs separate from other road traffic. 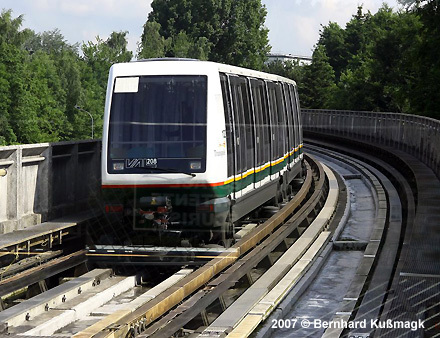 The current trains are made of 4 cars, they were designed by Pininfarina and built by Breda. 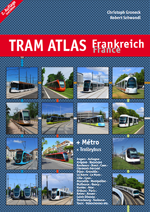 The tram runs underground at Gare Lille-Flandres, Gare Lille-Europe, St Maur and Clemenceau-Hippodrome stations. 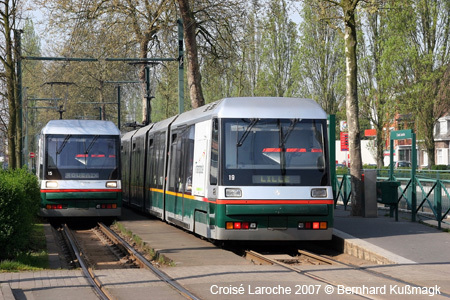 Ligne 1, CHR B – Calmette > CHU – Eurasanté; CHR – Oscar Lambret > CHU – Centre Oscar Lambret; Hellemmes > Mairie d’Hellemmes; Lezennes > Square Flandres. 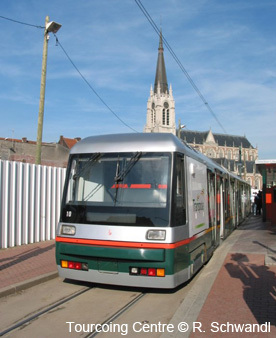 Ligne 2, Les Prés > Les Prés – Edgard Pisani; Croix – Mairie > Mairie de Croix; Gare Jean Lebas > Gare Jean Lebas – Roubaix; Tourcoing – Sébastopol > Gare de Tourcoing. 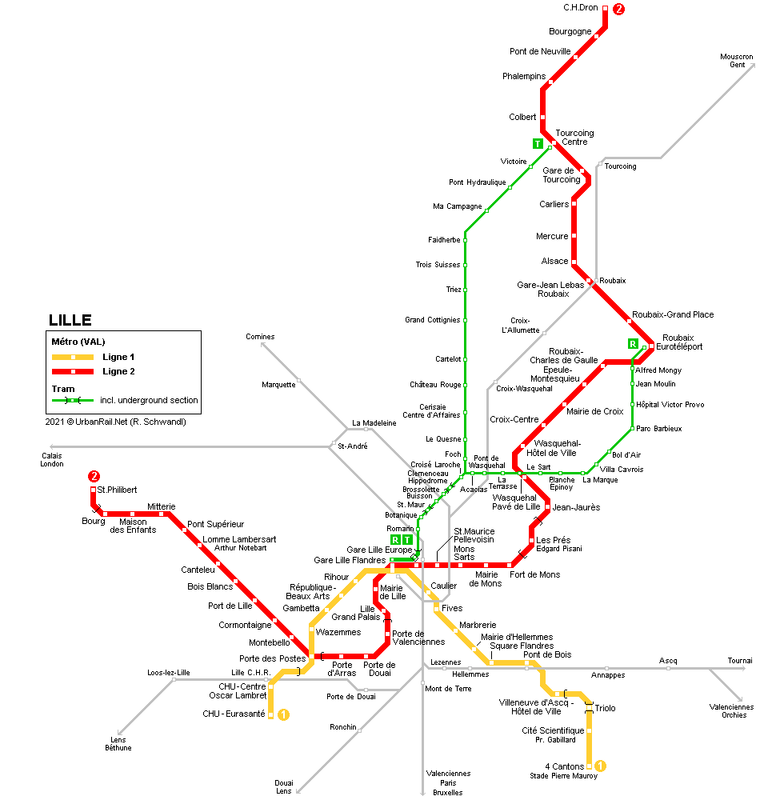 Possible extensions - Line 1 from C.H.R. B Calmette to Wattignies, Line 2 from St. Philibert to Perenchies and from C.H. Dron to Mouscron in Belgium, with possible branches from Roubaix to Hem and Wattrelos. Platforms on Line 1 are being lengthened to 52 m by 2017.